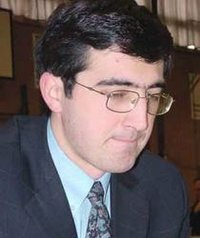 Vladimir Kramnik (Владимир Крамник), born June 25, 1975, is a Russian chess player. In 2000, he beat Garry Kasparov in a 16 game match played in London. In the eyes of the participants and many observers, this was a match for the world championship, and made Kramnik the chess world champion, although the International Chess Federation (FIDE) did not recognise the match as such. Kramnik was born in the town of Tuapse, on the shores of the Black Sea. As a child, he studied in the chess school established by Mikhail Botvinnik. His first notable result in a major tournament was his gold medal win as first reserve for the Russian team in the 1992 Chess Olympiad in Manila. His selection for the team caused some controversy in Russia at the time, as he was only sixteen years old and had not yet been awarded the grandmaster title, but his selection was supported by Garry Kasparov. He went on to win eight games, draw one, and lose none. The following year, Kramnik played in the very strong tournament in Linares. He finished fifth, beating the then world number three, Vassily Ivanchuk along the way. He followed this up with a string of good results, but had to wait until 1995 for his first major tournament win at normal time controls, when he won the strong Dortmund tournament, finishing it unbeaten. Kramnik continued to produce good results (including winning at Dortmund, outright or tied, in 1996, 1997 and 1998). In 2000, he played a sixteen game match against Garry Kasparov in London, a match that was billed as a world championship match, and widely accepted as being one in the tradition going back to Wilhelm Steinitz. Kramnik began the match as underdog, but his adoption of the Berlin Defence to Kasparov�s Ruy Lopez opening was very effective, and although pressed hard by Kasparov in those games where the latter played white, repeatedly managed to avoid defeat. Kramnik won the match 8.5 - 6.5 without losing a game. Kasparov regards Kramnik as the 14th world champion. In October 2002, Kramnik competed in Brains in Bahrain, an eight game match against the chess computer Deep Fritz in Bahrain. Kramnik started well, taking a 3 - 1 lead after four games. However, in game five, Kramnik made what has been described as the worst blunder of his career, losing a knight in a position which was probably drawn. He quickly resigned. He also resigned game six, although subsequent analysis showed that with perfect play, he may have been able to draw from the final position. The last two games were drawn, and the match ended tied at 4 - 4. In February 2004 Kramnik won undivided first place in the Tournament of Linares for the first time, finishing undefeated ahead of Garry Kasparov, the world�s highest-rated player, with whom he had shared the title in 2000. From September 25, 2004 until October 18, 2004 he successfully defended his title as PCA (classical) world champion against challenger P�ter L�k�. The match ended in a 7 - 7 draw, which was sufficient to allow Kramnik to keep the title. In the April 2005 FIDE ELO rating list, Kramnik is rated 2753, making him number five in the world (behind Garry Kasparov, Viswanathan Anand, Veselin Topalov and P�ter L�k�). This article is based on the article Vladimir Kramnik from the free encyclopaedia Wikipedia and stands under the GNU-Licence for free documentation. In the Wikipedia a list of the authors is available.